We have expanded our range of cast aluminium furniture to include a number of wonderful pieces of indoor dining room furniture. Our high quality metal dining tables are not just good-looking, but also durable and lightweight. Most of them are extendable dining tables, which makes them a practical option for those who sometimes need a couple of extra spaces at the table. The range of cast aluminium dining tables contains models in a number of colours, shapes and sizes. We have the square Ruby table in luscious white and champagne, which seats 4 and features a glass table top. Then there’s our extension dining table, Violet, that can seat up to 10 people, available in various colours. If you are not looking for a glass top dining table, we have a number of options. The Martha table is superb black metal dining table. Seating 6 people, the Martha table is 200cm in length and features a stylish x-leg design. The 8 seater Virginia table is a metal extendable dining table fully in aluminium, available in black, grey, white and grey, and white and champagne. When extended, the Virginia table is 244cm long. While you’re browsing, bear in mind also that we offer fabric and metal samples free of charge. If this would help you decide which colour is the right one for you, feel free to get in touch and request them. Many of our indoor dining tables have a sleek, glass table top. These glass top metal dining tables are durable and low maintenance. The toughened glass requires nothing more than a wipe over with standard glass cleaner to keep it looking good. The chairs for all our dining furniture sets are stackable. They are made from a combination of cast aluminium and a durable mesh fabric. Each dining table can be paired with one of a number of chair models. If you see one whose style you prefer to the default option, you can select it instead for between £10 to £25 per chair. Don’t forget to take advantage of our amazing offers before moving on to the checkout page. 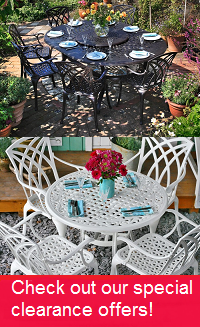 We offer some fabulous discounts on all kinds of garden furniture when you’re purchasing a dining furniture set. Get up to 70% off of a sun lounger, garden bench or side table! You may well find something that compliments your new indoor metal dining furniture. If you’re looking for a bargain, take a look at our clearance page, too. There are fantastic deals to be had on everything from sun loungers to 10 seaters. The deals you find here won’t be repeated. We offer free delivery on all our dining table and chairs sets. So there’s no need to worry about additional charges on the checkout page. Our dining furniture sets are delivered as a large package or on a wooden pallet by our partner couriers Parcelforce or Geodis. Both offer online tracking of your order from the day of dispatch. Geodis will also call you the day before delivery to arrange a time slot that works for you. For more details about delivery you can have a look at our delivery information page or give us a call. The friendly Lazy Susan team is on hand to take your calls or answer your emails from 08:00 to 18:00 daily. They can provide more information about our indoor furniture, help you with assembly instructions or respond to any other queries you have. Call us on 01243 717107 or email us at [email protected]. We try to answer emails within 2 hours during office hours. Mick in Northampton, Northamptonshire has just ordered a Ruby Table - White & Champagne. Linda in Thetford, Norfolk has just ordered a Alice Table - Antique Bronze (4 seater set). Frances in Bristol, Somerset has just ordered a Alice Table - Slate (4 seater set).